Looking for more of the good stuff ? Want less stress & worry? We do, too! At Bottom Line Accounting we are on a mission to help entrepreneurs manage their accounting & bookkeeping challenges with experience, accuracy, & a little fun! Have a question, found a broken link, want to share something awesome you think we should add here? Contact us! QuickBooks Online Demo - Thinking about converting to QBO, but don’t want to compromise your data? Test drive this demo first! ViewMyPaycheck - Intuit website where you can view your pay stubs and other payroll info. ViewMyPaycheck - Get Started Instructions and helpful highlights. IRS - How much will be withheld from my employee’s paycheck? IRS - Answers on YouTube! IRS - How long should I keep records? State Tax Agencies - All on one page! Every .75 seconds, somewhere in the world, an employee clocks in using TSheets time tracking and scheduling software. Thousands of companies in over 100 countries trust our online timesheet and drag-and-drop scheduling technology. Employees track time using a computer, mobile phone, GPS-enabled apps, text, dial in and more with clock in / out punch card or manual timesheet flexibility. This adds up to make TSheets the #1 employee rated and requested time tracking and scheduling software on the planet. Affiliate Link: If you choose to make a purchase after clicking the picture below, we may make a small commission, at no additional cost to you. It’s a win-win. 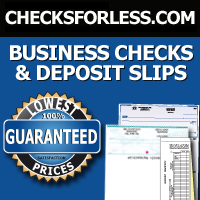 We have used ChecksforLess.com products for years and recommend their products to our clients for their business banking needs. ChecksforLess.com offers quality products, excellent customer service and the “Lowest Prices” guarantee. If you use QuickBooks, be sure to click on “QuickBooks Compatible” under “Shop By Category”. The first step to stress-free accounting!